I just got up from dinner. Just something quick tonight, but still giving me the feeling of having had a tasty meal. 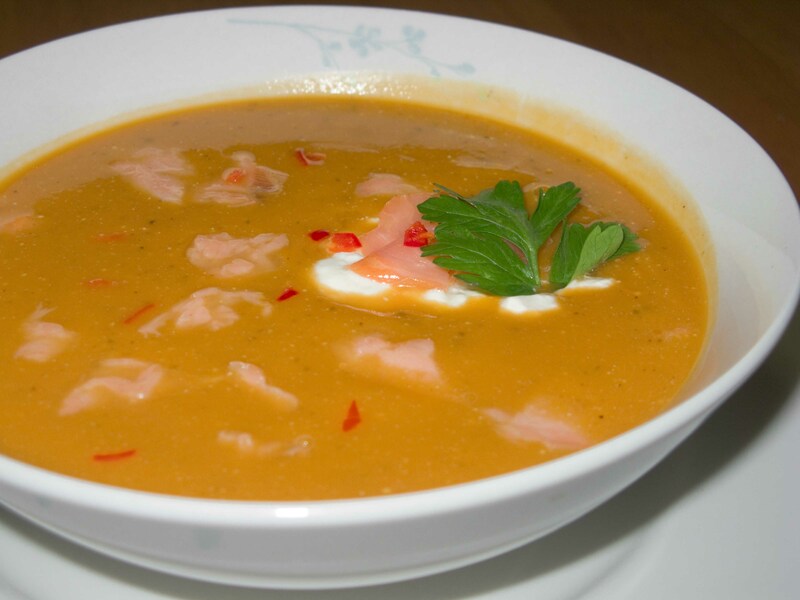 Just to mention this before even getting started with the recipe: the combination of pumpkin soup and smoked salmon might sound a bit odd, but try it and judge afterwards. I came across pumpkin soup with smoked trout fillets in a great restaurant back home in Switzerland, and after initial doubts I enjoyed a wonderful meal! The substitution with smoked salmon works well too. The soup is also tasty without fish if you don’t like this thought at all. Peel the pumpkin, remove the seeds (you can use them as decoration if you like) and cut cubes of about 2cm edge length. Cut the onion, the ginger and the chilli in small pieces. Peel the tomatoes and also cut them into cubes. Melt some butter and fry the onions for a few minutes. Add the pumpkin cubes, ginger and chillies and fry for another few minutes. Finally add the tomatoes and the parsley and deglaze with white wine a few minutes later. After the volume of white wine has decreased considerably add the beef stock and simmer at medium heat until the pumpkin pieces are soft. Homogenise with your kitchen tool of choice and refine with sea salt, fresh ground pepper and nutmeg to your liking. Remove the pan from the heat and add a few table spoons of crème fraiche (sour cream). Add pieces of smoked salmon immediately before serving, decorate with crème fraiche, parsley and chilli. I enjoyed the soup together with a glass of Villa Maria Sauvignon Blanc Cellar Selection. A good match. This entry was posted on July 5, 2008 at 11:34 pm and is filed under Food and Wine, Recipes. You can follow any responses to this entry through the RSS 2.0 feed. You can leave a response, or trackback from your own site. This soup looks good, although you are right about the combination of pumpkin soup and salmon sounding a bit odd but I love salmon! so im definitely going to try this.